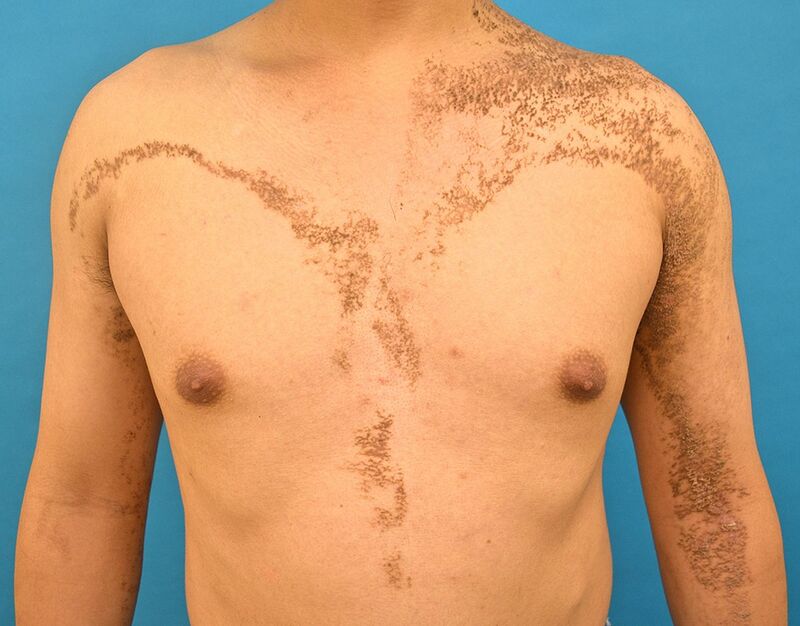 A 14 year old boy presented with multiple asymptomatic linear velvety lesions on the anterior chest and upper limbs, which had been present since birth (fig 1⇓). These lesions increased in number and grew larger as he grew older. Physical examination showed multiple verrucous papules and plaques following the lines of Blaschko. Skin biopsy confirmed a diagnosis of epidermal naevi, congenital hamartomas of ectodermal origin that occur in one in 1000 live births. Rare complications are development of basal cell carcinoma and squamous cell carcinoma within the naevi. Epidermal naevus syndrome refers to the involvement of other systems, including the skeletal, ocular, and central nervous systems. Infants and children with extensive epidermal naevi require thorough dermatological, neurological, ophthalmic, and orthopaedic examinations and regular follow-ups. We found no systemic involvement in this patient.